Show that you support Parkinson's Disease Awareness with this useful Personalized Parkinson's Awareness Athletic Dept. Sports Bag. 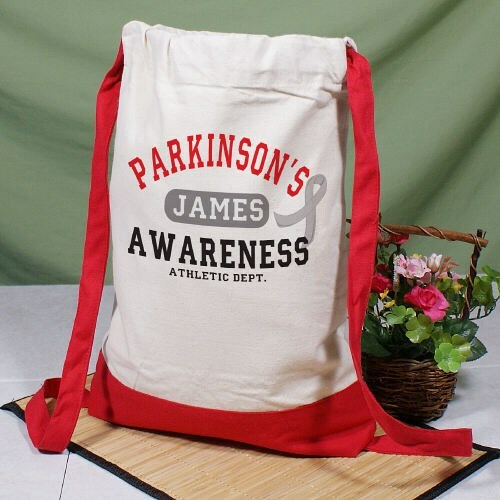 Our Parkinson's Awareness Sports Bags are great for spreading awareness wherever you go, whether it’s to the gym, grocery store, work or at your Parkinson's Disease Awareness Events. FREE Personalization is included! Personalize your Parkinson's Awareness Athletic Dept. Sports Bag with any name! You may also select a color for the trim of the bag as well! Our Personalized Parkinson's Disease Awareness Athletic Dept. Sports Bag is made of 12 oz. Canvas with a Cinch Closure. Measuring 14" x 18" x 2". Each Custom Sports Bag is made especially strong to hold your important essentials with a drawstring top closure. Additional Info Your Parkinson's Disease Awareness Sports bag is a great gift. Show your Support while using this sports bag at the grocery store or anywhere you see fit. MyWalkGear.com has many great Parkinson's Disease Awareness Shirts and Gear for your Awareness Event needs. You May also like to show your support for the person who you’re walking for with our Personalized Ease The Burden Parkinson's Disease Awareness Water Bottle and our Parkinson's Hope For A Cure Hat as well!